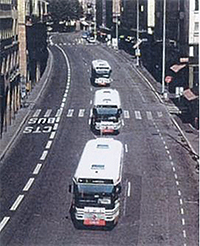 As traffic congestion continues growing in urban areas, more and more people have realized that they should use public transport modes, such as metro, BRTS or buses, instead of private vehicles, because public transport modes are more efficient than private vehicles in terms of carrying and moving people with the same amount of road space. However, international experiences tell us that building more metro lines or putting more buses on the road alone may not be able to increase the use of public transport modes. There are many other urban design factors, or non-transport factors, that play a critical role in a traveler’s decision on the travel mode. The first critical factor is density. Let’s look at two cities: Atlanta (in the US) and Barcelona (in Spain). Both cities have about 2.5 million population, and both have metro and bus systems. However, while 30% daily trips are carried out by public transport in Barcelona, only 4% in Atlanta. Why? A study carried out by the World Bank found out that density in Atlanta is far smaller than Barcelona and thus the built-up area in Atlanta is much bigger than Barcelona, which in turn makes it very difficult to provide the same level of public transport services in Atlanta as in Barcelona. As a result, more people use public transport in Barcelona than in Atlanta. Another factor is accessibility. Researchers have found that just having a high population density may not guarantee that more people will use public transport. 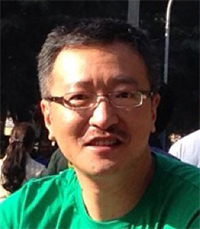 Let’s look at Beijing, London and Paris. 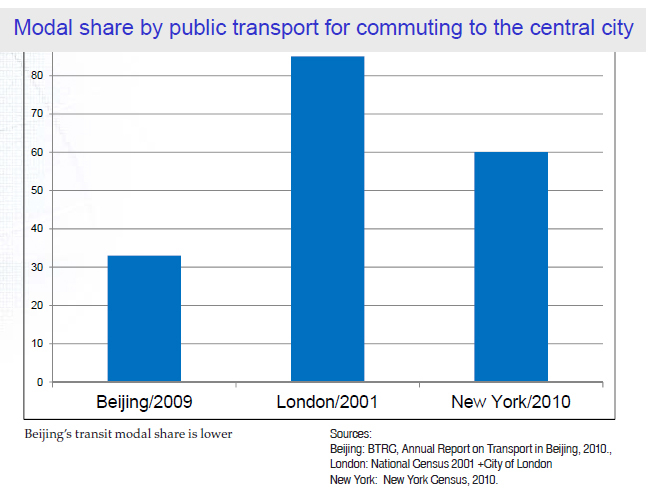 On average, Beijing has much higher population density than London and New York in the city center, but public transport mode share in Beijing is much less than New York and London (Figure 5). Why? A close look at the urban fabric of the three cities helps us understand the reasons. Let’s go to a metro station in each central business district of the three cities: Guomao in Beijing, Oxford Circus in London, and Grand Central Station in New York. Researchers from the World Bank found out the number of jobs located inside the areas that can be reached within a 20 minute walk from the three metro stations is quite different, with Guomao has the lowest number and Union Station has the highest. Since people normally can walk for maximum 20 minutes without a break, those whose offices are located inside the catchment areas would be able to walk from the metro station to the office (or walk from the office to the metro station) without difficulties and thus the likelihood for those people to use metro for commuting is higher than those who offices are located outside the 20 minutes catchment areas. Among three cities, the fact that Beijing has the lowest number of jobs located within the convenient walking distance from the busiest metro station explains why Beijing has lower mode share by public transport than other two cities. However, why would this have happened? Don’t we forget Beijing has higher population density than New York and London? A further closer look found out that the urban spatial environment in the three cities is quite different very wide streets, very big size street blocks, buildings set-back quite far from the edge of the streets in Beijing; narrow streets, very small size street blocks, buildings right on the edge of the streets in New York and London. Because of these differences in urban fabric, the number of buildings and the size of office floor areas in Beijing that are located within the 20 minutes walking distance from metro stations (or accessible by metro) actually are not big, despite Beijing has the highest density (on a city wide average) among three cities. The third critical factor is walkability. 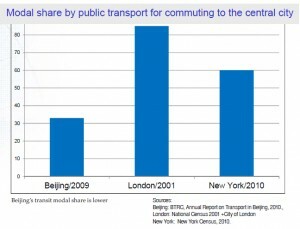 Here is another study carried out by World Bank on a BRTS in a Chinese city. The study finds that while most people who are using the BRTS live in the areas within 500 meters (or 20 minutes) walking distance from a BRTS station, in some places, people who live more than 900 meters away come to use the BRTS by walk. But in some other places, many people whose houses are just more than 100 meters away from the BRTS stations do not come to use the BRTS? To figure out why, the researchers did site visits and interviews of BRTS users. The first photograph above shows a street that is not very wide, covered by trees and there are many shops along the street. Many people walk while shopping on that street during the most of time every day. People interviewed there said they like to walk on that street and they don’t really feel tired even when they walk a long distance. That is the place where people walk upto 900 meters to come to use the BRTS. The below photograph shows another place where there are a very wide elevated road, a narrow and poorly maintainedsidewalk, and very few trees. No one interviewed there said they’d like to walk on that street. That is the place even those who live only 100 meters away from the BRTS would not come to use the BRTS. Many Indian cities are now building or planning to building metro and BRTS, with an aim to get more people to use public transport instead of private vehicles. These efforts should definitely be applauded. However, it is also important to look at those critical non-transport factors that are affecting people’s decision on the use of public transport, such as density, accessibility and walk ability, as illustrated in this article. Better urban planning and complementary investment in urban spatial environment to address issues are also necessary.